All photos by Pierre Pellegrini, Switzerland; Courtesy of the Galleria Valeria Bella Stampe, Milan, Italy. Swiss photographer Pierre Pellegrini is drawn to remote landscapes dotted by tree groves, snow-topped piers, and structures that have fallen into a state of disarray. Long exposure photographs force Pellegrini to sit quietly with these scenes, meditatively taking in the high contrast landscape as his camera processes the deep blacks and brilliant whites that emerge in the dead of winter. “I simply photograph what I feel, and am always looking for moments and situations where everything is in its place,” he explains to Colossal. “I try to find a sort of harmony between what I see and what I feel.” You can see more of his square format black and white photographs on Instagram. 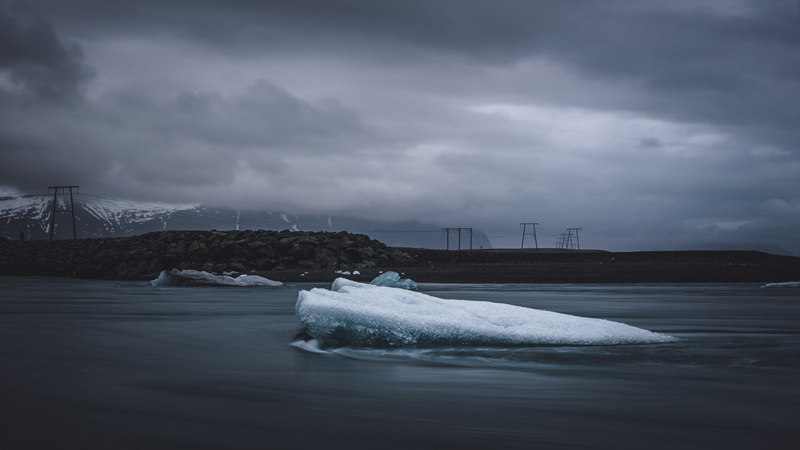 Photographer Jan Erik Waider (previously) splits his time between Hamburg, Germany and traveling through the harsh and unpredictable climate of Nordic countries like Greenland, Iceland, and Norway. In each of these locations Waider seeks the most remote and hidden locations, wishing to present rarely seen perspectives of the native landscape to a larger audience. For more than a decade he has captured the monumental beauty of northern glaciers, isolating their color and shape in a way that makes the icy cliffs appear almost extraterrestrial. Waider offers prints of his personal photographs on his website. You can view more images from his northern expeditions on Instagram, Twitter, and Behance. The photographer shares with Colossal that challenging conditions are part of the game when shooting outdoors during the winter. Schönberger treks in with snowshoes or cross country skis, and sometimes waits two hours or more in frigid temperatures for the right shot, while battling shortened battery life and fickle sunlight that is needed to illuminate a scene without melting delicate frost. In addition to his Behance portfolio, you can see more of Schönberger’s work on his website and Instagram. There are over five and a half million vending machines across Japan which sell a variety of merchandise from soda and cigarettes, to fresh eggs and flowers. These machines are not only scattered within the large city centers of the country, but also are common sights in smaller, more rural towns. The beverage dispensers are functional all night, serving as main a light source in remote areas without prevalent night life or street lamps. Many vending machines populate the country’s prefecture of Hokkaido, a northern island that experiences harsh winters. Photographer Eiji Ohashi noticed how the light from these vending machines would illuminate surrounding snow, precipitation that had either piled on top of the machine or buried it completely. These glowing subjects became a source of intrigue for Ohashi who has created a series based on the machines titled Time to Shine.